Free entry to DJ bar/ restaurant and canal terrace (additional pay-as-you-go payments for bands). Our next paddle through the cultural shockwaves still rippling from the era of psychedelia draws inspiration from seminal London counter culture night club, the Arts Lab. A short-lived experimental club night, Arts Lab was opened in 1967 by Jim Haynes, a leading figure in London’s counter-culture. Amongst Arts Lab regulars was a young David Vorhaus, who formed pioneering electronic band White Noise in 1968, with his partner Deliah Derbyshire – herself a prominent member the BBC Radiophonic Workshop. Deliah was also responsible for the Dr Who theme tune. White Noise’s first LP, An Electric Storm, is widely regarded as the UK’s first proper electronic LP. David and White Noise will be making a rare live appearance at Smart Lab. Other regulars at the original Arts Lab included John Lennon, Yoko Ono and David Bowie – who performed at Arts Lab in December 1968 and later set-up his own Beckenham Arts Lab in honour of the central London version. Smart Lab is inviting people from every genre of the arts and technology to come and get creative. The original Arts Lab invited people to pay what they wanted to. For the new version the music in the bar and on the canal side is free, but to see the additional acts in the live room the audience pays per performance. The acts set the fee for each performance themselves. 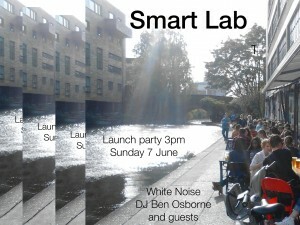 Smart Lab is held on the banks of the Regent’s Canal in Dalston at the Barge House, home to the popular Sunday brunch – Breakfast in Bread.